Every time I pick a restaurant to try out, I do so with the greatest of hopes. I'm always searching for something that will make me smile. I'd never knowingly pick a place to purposely have a poor experience. I like eating at and writing about good places as much as people like reading about them. Almost always, I go to establishments that I've heard a few nice things about. 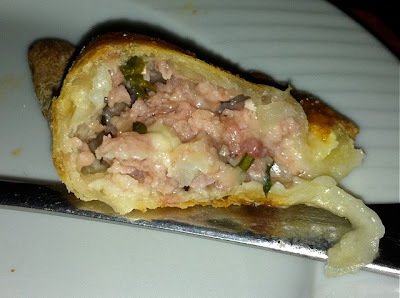 Recently, my most prolific tipster, Pivobud, wrote that he'd read a positive review on this site about Tapas Chorizo de la Cambusa. He said the menu looked pretty interesting. I then looked on Tripadvisor.com, where almost all the reviews were flat out raves. It had been a long time since I'd had tapas, so I thought it would be fun to give it a try. 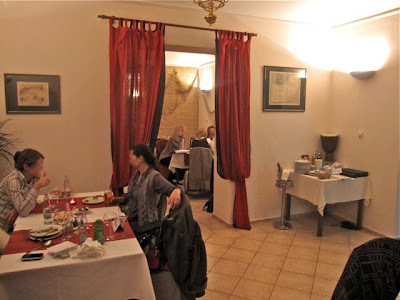 The restaurant is a 5 minute walk from the Nový Smíchov mall, with many tram lines and a metro stop nearby. The interior is rather unappealing. The harsh light from the sconces accentuated the starkness of the white-walled room and its cheap-looking floor tiles. There is a non-smoking room that has the benefit of some wood paneling and beige brick work. For the narcissists out there, one wall is covered with mirrors. Still, I remained optimistic. A Czech newspaper review summed up the restaurant by saying, "Great food, lousy atmosphere." And I do care far more about food than atmosphere. First came the drinks. My Friend had a .2 liter glass of white wine (78 CZK), which was pleasantly dry. 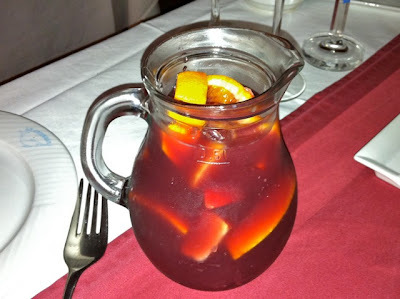 I had a glass of sangria (50 CZK). It had been a long time since I'd had a decent glass of the stuff, and this was excellent. It was just lightly sweet, but not too much so, with a lovely tang from the abundant lemon, lime, and apple slices. The wine itself was decent quality. Very refreshing. We ordered many rounds of tapas. I started with the recommended "Landlord's famous octopus" with garlic and chili (105 CZK). Served warm, it came in a delicious, spicy broth. The chopped tentacles themselves were bit overcooked and rubbery. Next came the Tortilla de Jamón Serrano (55 CZK). 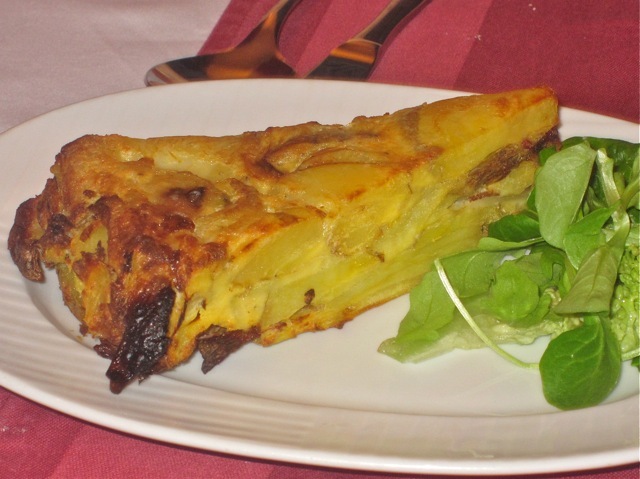 The warm slice of potatoes mixed with egg was rather dry and bland, with very little ham. I got the two empanadas (55 CZK). 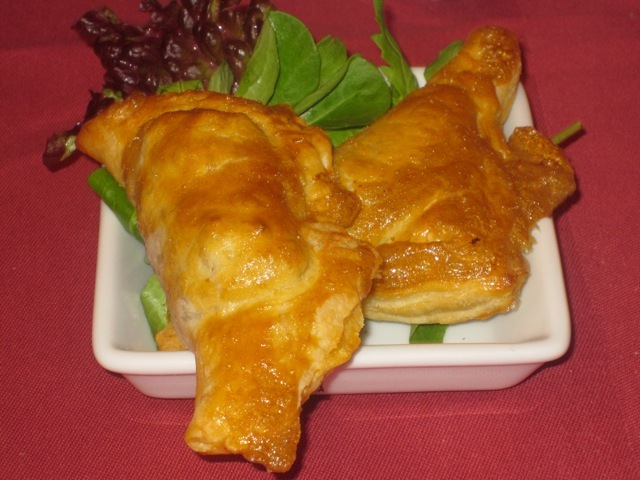 Varying fillings for these warm, light, flaky pastries are available and change on a regular basis. I had one with dry, ground beef that had a pleasant grilled flavor. 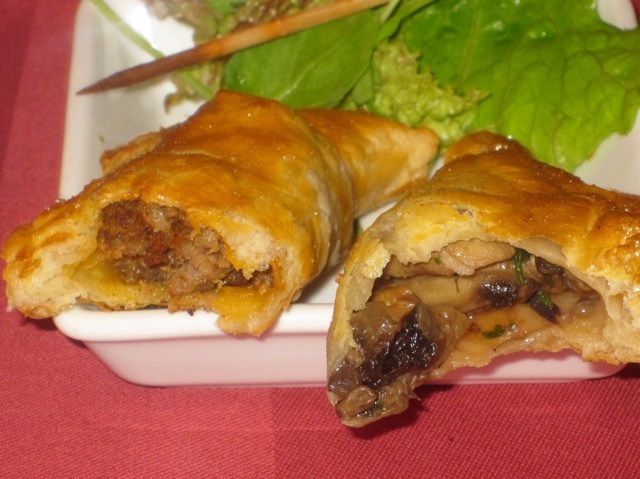 But I preferred the moister empanada with mushroom filling. I would note that they were one-third the price of the empanadas at La Casa Argentina. 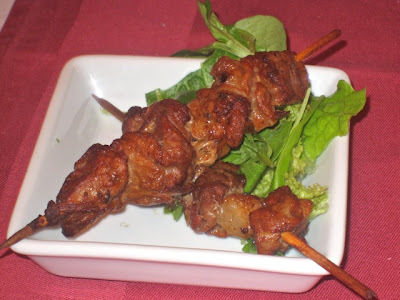 We had the "very popular" (according to the menu) lamb skewers (85 CZK). They had only a light, lamby flavor and were on the dry side. They were dry on my second visit, as well. I decided to go for something that was not tapas, so I ordered the "American style flank steak" also called the "Bavette Ambassador" on the menu (285 CZK). It comes with potatoes on the side, and I chose the baked potato. I've ordered and/or cooked many bavettes and flank steaks in my day. This didn't look like one to me. The cut was thick and almost rectangular. The beef was grilled medium-rare as requested. But it was one of the toughest, hard-to-chew steaks I've had in a long time. I ate about half and gave up. I just ran out of jaw power and interest. It came with a sauce on the side, and I took the Madeira. I could taste a hint of the wine, but otherwise, I found it quite indistinct. A shot of salt helped. Our waiter was super-friendly and efficient, moving quickly around the room with a smile. When he asked me how the food was, I told him of my disappointment with the steak. He said he was sorry I didn't enjoy it. I was really full, but decided to have dessert. 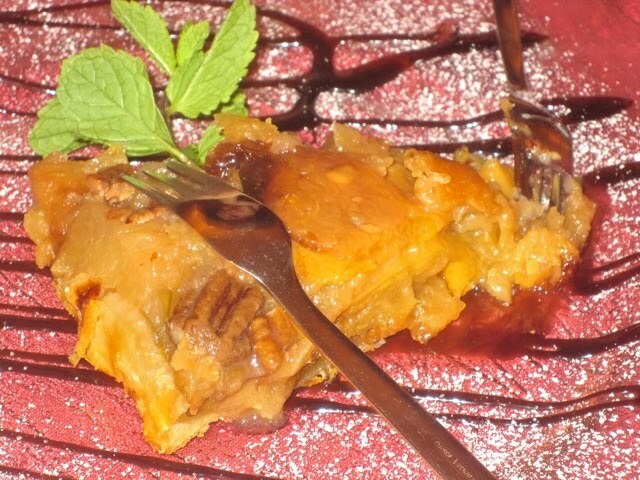 We got the tarte tatin (55 CZK). Served warm, it was a delicious combination of tart apples, a buttery crust, and pecans. I only wished for more of the nuts in there. During the meal, a Saudi man at the next table struck up a conversation with us. I asked him how he'd liked the pan of paella (265 CZK) he'd shared with a friend. He said he'd eaten this dish many times around the world, and he rated this one as very good. At the end of the meal, the waiter asked me if I was driving, and I said no. Shortly after, he brought me a cocktail called a Bramble, which he said was on the house. I asked why, and he just smiled and walked away. 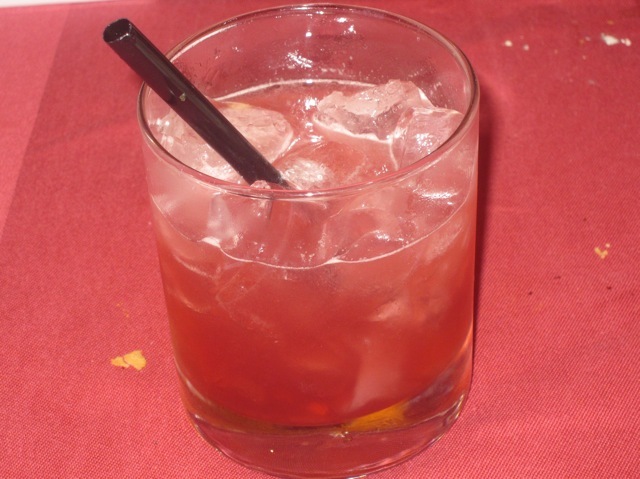 A Bramble consists of lemon juice, sugar, and blackberry liqueur. I'd never heard of one before, but I'm now a fan. It was very good. Our bill, which included 3 glasses of wine, was 956 CZK before tip. That's not bad, considering how much food we'd had. But I felt the quality was quite mixed. I felt I had sampled enough to review, but not to satisfy my curiosity. 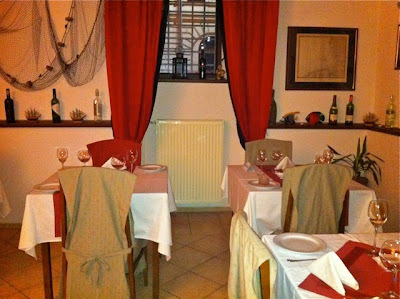 I returned again a week later with My Good Friend The waitress could not find my reservation, and we spent some time discussing it. But it was a rather unnecessary conversation since there were several free tables. On this visit, the lighting started out lower, but it didn't do much for the style or atmosphere. Later, the waitress, made it brighter. I told My Good Friend about the sangria and got a .5 liter pitcher. She was also wary after some bad sangria experiences, but after one taste, she agreed it was very good. We put in our tapas requests. 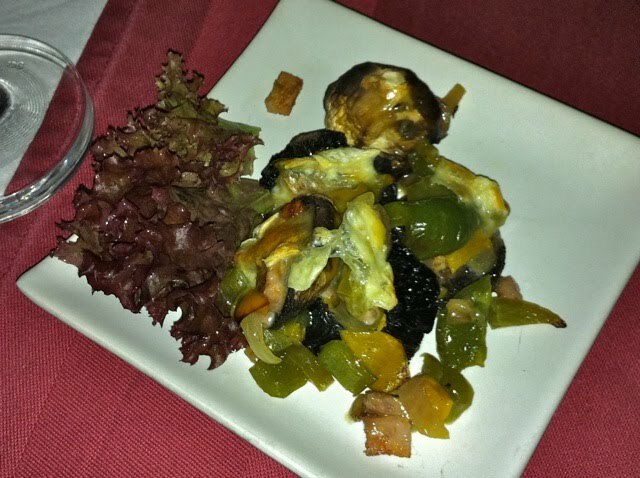 MGF ordered the mushrooms stuffed with peppers, onion and ham with cheese au gratin (55 CZK). This was great. It looks like kind of a mess, but I assure you, it was delicious. In fact, we ordered a second plate of it. Less successful was one of this night's empanada, which was filled with ham and cheese (55 CZK). We both thought it too salty. We also had the beef, which was fine. 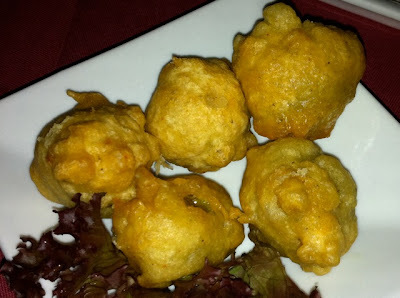 Also very salty were the batter-fried olives stuffed with marinated anchovies (49 CZK). That is to be expected, though the flavor of the olives was so strong, I could barely taste the little fish. The exterior was nicely crispy and crunchy. 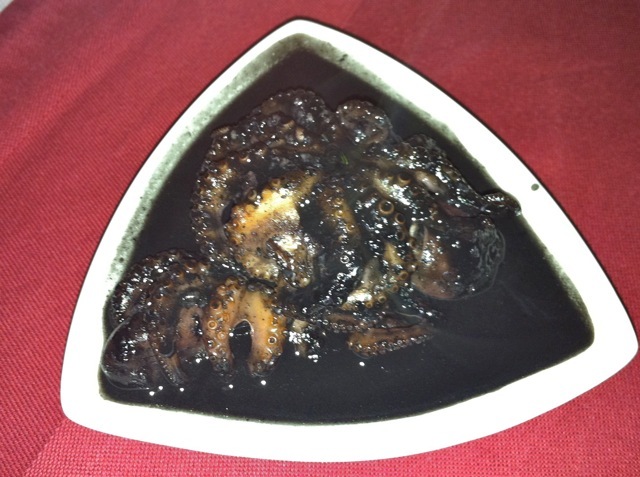 I tried out the baby octopus in white wine and sepia sauce (65 CZK). 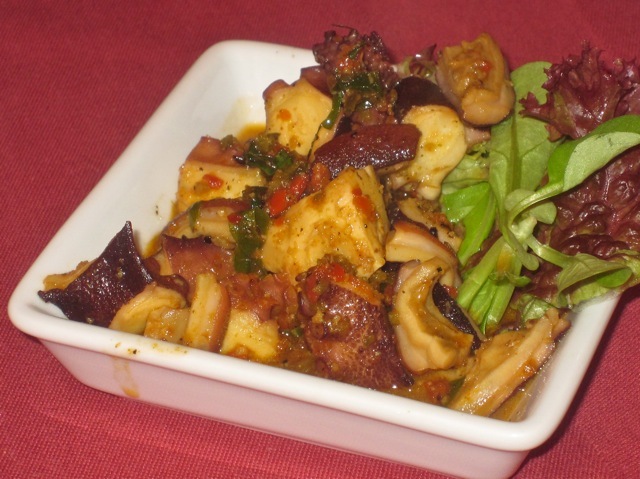 The four little octopuses were fresh and tender. 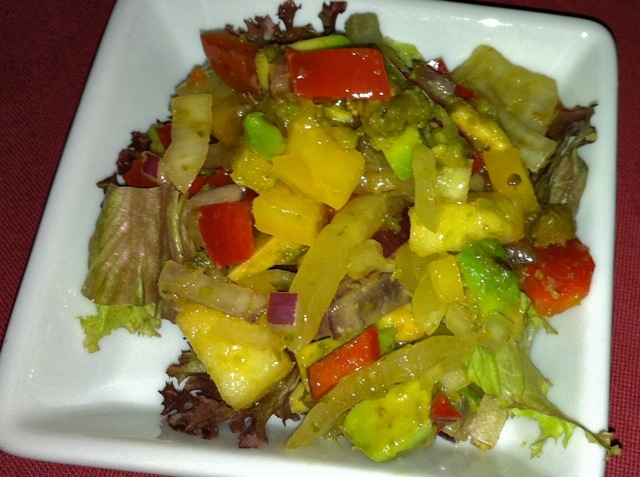 But the sauce also had too much salinity, which overwhelmed the flavor of the seafood and any hint of wine. 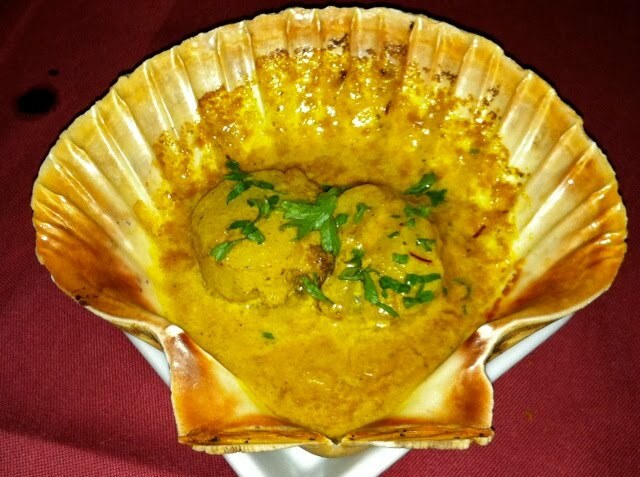 I had the grilled scallops in saffron sauce (155 CZK). The two modest molluscs were good quality and just lightly seared to preserve their delicate texture. There was a hint of saffron in the creamy sauce, but I found it otherwise bland. We were both happy with the salad of avocado, peppers, tomatoes, apple, onions and "Mediterranean sauce." (65 CZK) It was a little burst of flavors and textures. 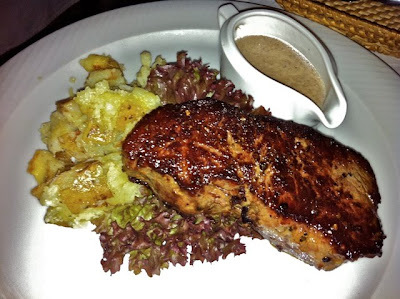 We shared the oven-baked marinated pork ribs (65 CZK). We both decided we liked them a lot. 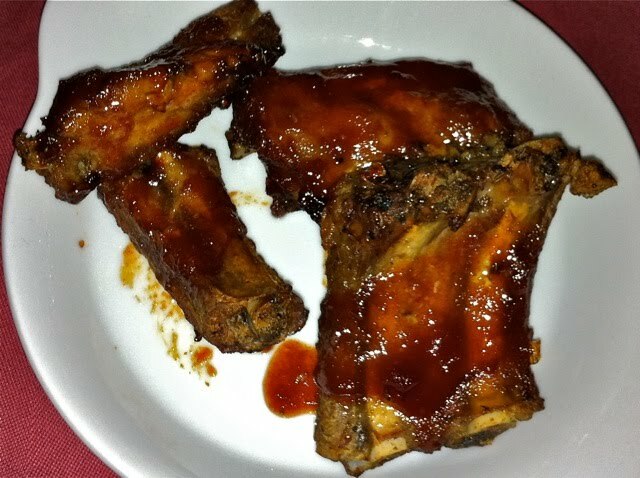 The finger-sized babyback style ribs had crispy exteriors, and juicy interiors. I enjoyed the tangy sauce on them so much I wiped up the last drops on the plate with the bones. Finally, I had to try the steak again. But this time, I went for the most expensive one on the menu -- the Argentinian entrecôte (360 CZK). I was both disappointed and surprised. 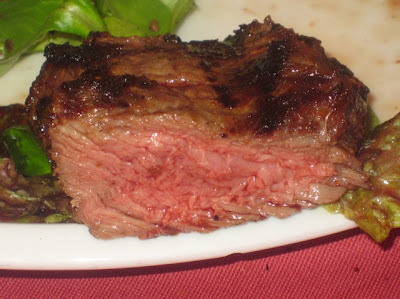 This steak was virtually identical with the one I'd had the previous week, with the same thick, rectangular shape. 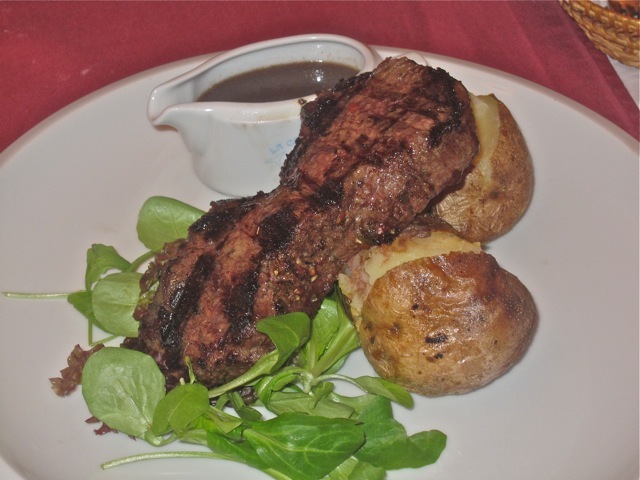 The tough, dense steak lacked the fatty marbling usually present in entrecôtes and rib eyes. I'd asked for it cooked medium rare, and this one was medium well. The menu said the steak was prepared on a lava grill. This one had a uniform brown crust that looked like it was cooked in a pan, rather than black stripes from a grill. There was no smoky flavor. I had about a third of it, and called the waitress over for a mini Spanish inquisition. I told her I didn't think I received the correct steak and that it appeared identical to the flank steak I'd had before. 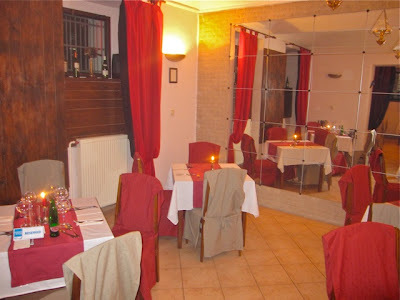 She went back, talked to the chef, and assured me he said that I had the entrecôte. She offered to bring the him out to talk to me, but I declined. I didn't eat any more of the steak, the decent crushed potatoes, or the fairly boring pepper sauce on the side. I'd had enough. I'd add at this point that the rave reviews on Tripadvisor.com seem odd to me. First, almost all are relentlessly hyper-enthusiastic and make the restaurant sound like the greatest in Prague, if not on the planet. 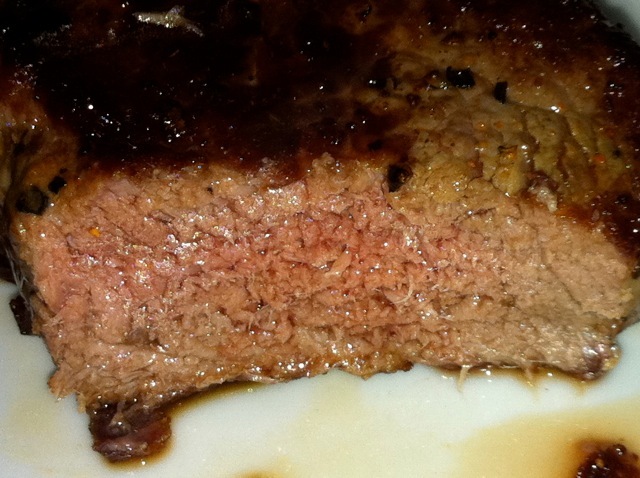 Second, two people wrote about how great the steak was, with one saying it was the "best steak ever." Of course, different people can have different experiences on different nights, but based on my experiences, those comments are not even close to reality. 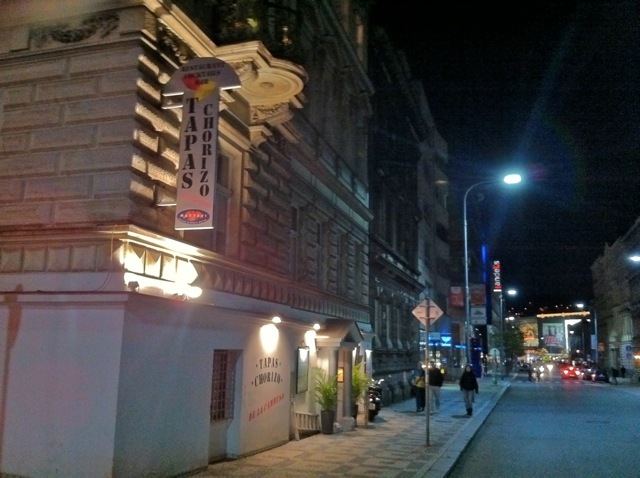 The bill for the second meal came to 1246 CZK before tip. I felt that on both visits, there were a few very nice tapas plates, but also too many that I found just average or not appetizing. Both my guests felt the same way. 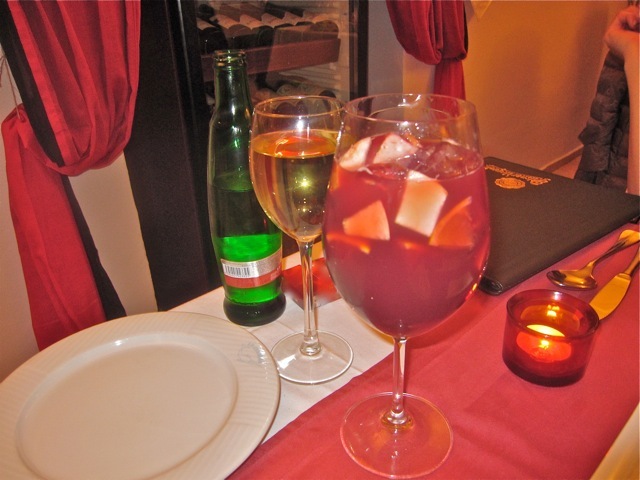 I think it's possible you could have an enjoyable meal if you order the more successful dishes I mentioned, the sangria if you enjoy that beverage, and perhaps the paella. 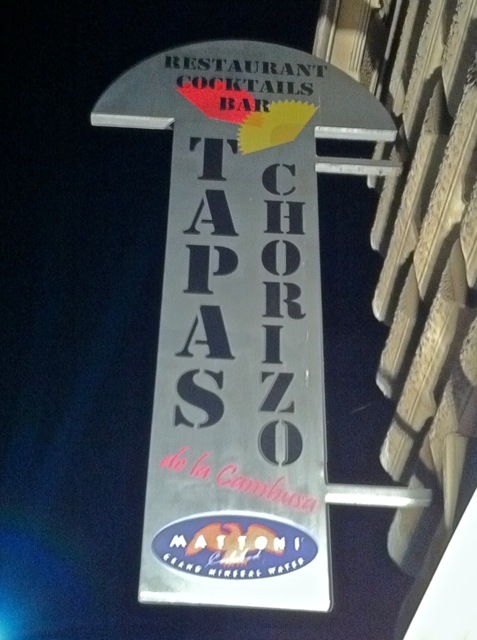 As for me, I doubt I'll be returning Tapas Chorizo de la Cambusa. On balance, it just didn't speak my language. wow i got all excited about the thought of a good tapas place...well i guess trying the ones you liked and good sangria would be worthwhile. too bad about the steaks, it's not that hard for a restaurant to get good cuts of meat.